IT companies (hardware or software) offer support to their products by releasing updates. A computer may have hardware manufactured by companies other than Microsoft. For example, a PC may have Intel motherboard and Ethernet card, a Realtek WiFi module, AMD Processor, Radeon GPU, Dolby Sound system, Logitech Mouse, etc. If the PC has Linux OS, the drivers will be updated automatically. But, if the OS is Windows, you’ll have to use a third party driver updater program. The Windows OS is capable of updating itself to the latest version, but it doesn’t update drivers of third-party hardware vendors. A new and lightweight program to manually update drivers on your PC is Snail Driver. This tool will find outdated drivers on your PC immediately after you run it. Its main window displays a scan button, the number of outdated drivers on your computer and date on which the last scan operation had executed. This Program requires an internet connection to compare driver versions and download the latest files. Once the outdated drivers have been found, the program will allow you to update them to the latest version. You will be allowed to chose the drivers which you want to update. Snail driver will save the downloaded files to C:/DriverDownload folder. You are allowed to change the default download folder through the options window. To access this window, click on the gear icon. This utility has an option of canceling an update task. If you cancel a task, the program will not delete the partially downloaded files. When you run Snail Driver next time, it will begin downloading the files from the point at which the transfer task was canceled. This software doesn’t have an option of pausing the driver update task. 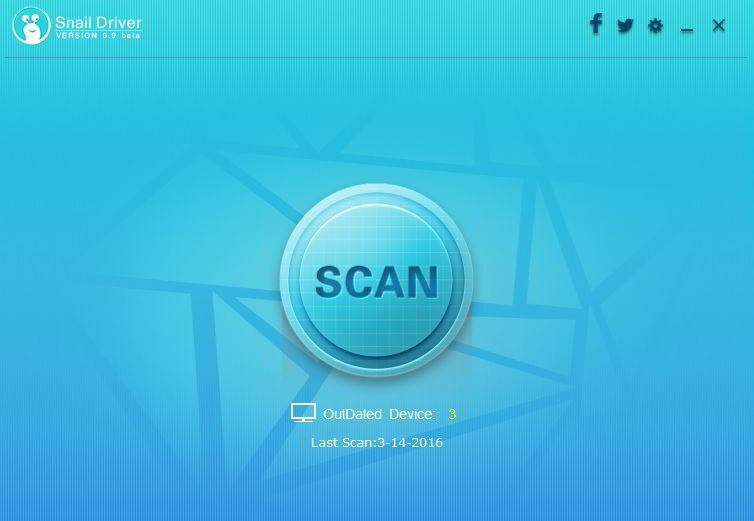 It can be configured to scan the PC when Windows OS starts. This program supports batch download operation. It supports maximum 10 files at a time. It can be minimized to the Windows taskbar. When the drivers have been updated, SD will make you aware of it. This utility is free to download. It doesn’t have malware and advertisements. I’ve tested it on the Microsoft Windows 10 laptop protected by the Kaspersky Internet Security 2016. Conclusion: If you’e looking for a simple, but powerful utility for updating drivers, install and use SD. Though the program is still in the beta version, it works great on Windows 7, 8, Vista and 10 operating systems.